ferris wheels, and other Fun Rides. Have you ever wondered what makes a Roller Coaster go? 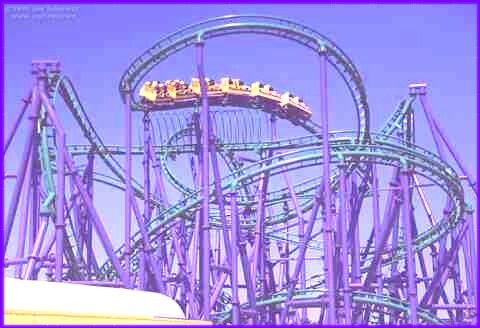 Have you noticed that Roller Coasters do not have engines? Let's take a Roller Coaster ride to see how it works. Hang on tight! Listen to the clanking wheels clank and clatter as your car is pulled slowly to the top of the first hill. Now over the top and down the other side. The higher the hill, the faster you go because GRAVITY keeps pulling you down. Suddenly, with a sinking heavy swoop, your car starts to climb the next hill. As you go up, you go slower and slower because GRAVITY is still pulling. On Roller coasters, the "down" side of the hill is always longer than the "up" side of the next. So GRAVITY can always pull you down one hill fast enough to roll you up and over the top of the next hill. And so you clatter and sway up and down each hill getting smaller and smaller until you reach the end of the ride. So now you know what makes a Roller Coaster GO! G R A V I T Y.